Giveaway: Belterra Park Market Buffet's Shrimpapalooza | The Food Hussy! I love the folks at Belterra Park - it's the newest Cincinnati Gaming center and has made quite a transformation of the former River Downs! Right now they have a fantastic addition to their Market Buffet and it's called Shrimpapalooza!!!! You can experience Shrimpapalooza now thru October 30 for just $19.95 Sun-Thurs 4pm-9pm and $28.95 on Friday & Saturday (Unlimited Crab Legs!). Belterra Park Gaming is on Kellogg next to Coney Island - in addition to gaming they have live horse racing and multiple restaurants! 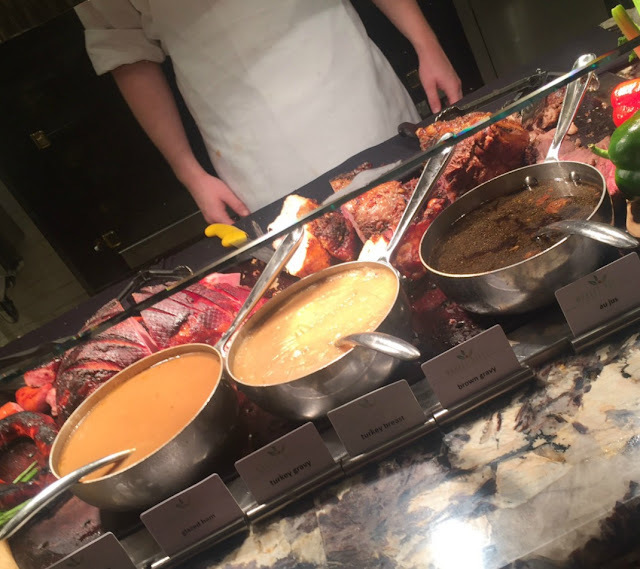 The Market Buffet has all your favorites like a carving station and foods from every corner of the globe - Chinese, Italian and more... The thing I love about Belterra Park is that they've gotten chefs that specialize in a variety of foods to be sure that they keep it authentic. But enough of all that - let's get to the shrimp! You'll feel very Bubba Gump with every kind of shrimp you can think of! Of course I started with the butterflied fried shrimp - big, juicy and crispy - just how fried shrimp should be! Then there was Drunken Shrimp with a zippy broth and a few scant veggies to make your meal balanced. The Shrimp Alfredo Pizza might have had me drooling - if you look up "cheesy" in the dictionary - this picture is there. Hell to the yeah. Teriyaki Pineapple Shrimp Skewers were very appealing and I was down with that - anything with pineapple is on my list to try. This was new to me - Shrimp Creole and Shrimp Au Gratin - they may not look like much in a casserole dish but I really liked the Shrimp Creole! There was also a charcuterie board - how can you pass up salami and crackers - even just one! Then the dessert bar - it's always a bit of mystery of what you're eating. What are these little purple frostinged boxes full of? I guess we'll have to try them and find out! So here was round 1 - shrimp, shrimp and more shrimp! I liked the butterfly shrimp and the shrimp creole best from this round. The pizza was delicious as well - super cheesy with a nice crispy crust. It was a knife & fork pizza but still tasty. I killed a lot of that butterfly shrimp - how could you not?! I also got a fun t-shirt and an introduction to their newest addition to the team - Chef de Cuisine Michael Inferrera (on the left). He's straight from Jersey - so it's a bit of a culture shock but he's hanging in there and doing a great job. He's really excited about the additions he can bring to the team. I had to go for Round 2 and try my two favorites: breakfast and mac & cheese. First - their mac & cheese is really really good. I love it! The breakfast is a fun addition as well - with biscuits & gravy as well as that home-made sausage I had to try. It was great! Lastly - I saved room for dessert - pretty much every dessert of course. I didn't eat them all - I was pick and just did bites of each and saved full consumption for my favorites. Starting at the top there was: Chocolate Lava Cake, Lemon Cake with Lavender Whipped Frosting, Cookie Dough Cake Pop, Chocolate Chip Cannoli, Pecan Pie Tart and Creme Brulee. The Lava Cake was my favorite although - I finished off the cake pop and creme brulee as well. The cannoli was also a good choice. The pecan tarte didn't have enough pecan pie filling for me and the lemon cake was fine but I hate that whipped frosting. I like my frosting super sugary. My friend Lou was raving about their Strawberry Gelato - she said the other Belterra doesn't have the strawberry but this one does and it's soooooo good. And it was! And after all that - I even got a rewards card and it came with $15 free to play with! So we spun $15 away but it was fun. Shrimpapalooza is on through the end of October and I'm running a giveaway for a buffet for 2 thanks to the team at Belterra Park. Enter below and tell me your favorite shrimp dish and you might be dining for free!